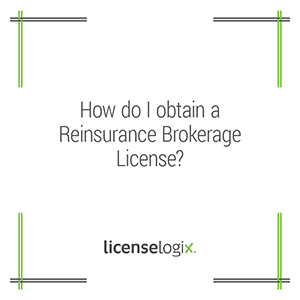 In order to obtain a Reinsurance Brokerage (or Reinsurance Intermediary Broker) license an applicant must generally: (1) Complete a NAIC Uniform Individual Application to be registered with the National Insurance Producer Registry; and (2) Pay both the state license application and state license fee. For non-resident applicants, a certification from their home state is often required as well. However, different states have requirements that vary depending upon their respective jurisdiction. Some states have simplistic requirements. In Massachusetts an applicant must: (1) Complete an application form; and (2) Write a check made payable to the Commonwealth of Massachusetts, Division of Insurance, in the amount of $200.00. For non-resident applicants, a Certificate of Good Standing from your home state indicating you are licensed in good standing as a reinsurance broker is required as well. In Florida, an applicant must: (1) Complete an application for the license and submit appropriate fees. In addition, the applicant must be fingerprinted. Each person applying for the first time in Florida and qualifying for a license as a reinsurance broker shall attach a full detailed credit and character report for the 5-year period immediately prior to the date of application. Some states have stringent requirements. In Georgia, applicants need to file a Certification Application for Certified Reinsurer. The applicant must be domiciled and licensed to transact insurance or reinsurance in what is called a "Qualified Jurisdiction." A qualified jurisdiction is a jurisdiction that is 1) an accredited jurisdiction in accordance with the NAIC financial and standards accreditation program; 2) qualified by the Commissioner as a qualified jurisdiction in accordance with the standards set forth in Ga. Reg. § 120-2-78-.08(3)(b); or 3) is a jurisdiction that is designated as a qualified jurisdiction by the Reinsurance Task Force, or working group thereof, and published through the NAIC Committee Process. The application fee is $600 for the initial application, and $700 for an annual renewal. There is a litany of additional requirements for licensure as well. We will help you obtain all the licenses your reinsurance company needs. Our license experts will compile all applications for you and provided detailed instructions on how to apply and the fees associated with each application. LicenseLogix can complete all applications for you and streamline the process. Get started today by requesting a quote or calling us at (800) 292-0909.